Ancillae-Assumpta Academy in Wyncote, Montgomery County, has named Amy Lintner as its new director. Sister Dorothy Beck, U.S. provincial superior of the Handmaids of the Sacred Heart of Jesus, made the announcement Oct. 2. 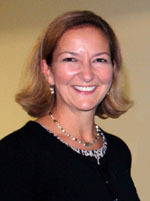 Lintner, a 1982 graduate of the academy, is the first alumna to hold the position. She began her tenure in July, preparing for the school year that started this fall. A member of the academy’s faculty since 1998, Lintner has served as a reading specialist, language arts teacher at middle-school and junior-high grade levels, as a member of the resource learning team and as both a language arts and testing coordinator. Most recently, she also was the chairperson of the language arts curriculum. In addition, Lintner recently served on the academy’s Middle States Reaccreditation Team, overseeing the staff development long-range plan. Lintner earned a degree in elementary education from St. Joseph’s University and a master’s degree from Holy Family College. She is Wilson-certified and a member of the ASCD (formerly known as the Association for Supervision and Curriculum Development). She also is a member of the International Reading Association and the International Dyslexia Association, including the Pennsylvania chapter. “I am proud to be carrying on the legacy that Sister Elizabeth McCoy, the academy’s first director, started here,” said Lintner. “This is a great faith and learning community with a tradition of pursuing personal excellence in a warm and friendly atmosphere. A resident of Meadowbrook, Lintner’s husband, Dale, and their four sons also graduated from the Academy. Ancillae-Assumpta Academy is a private, co-educational, Catholic elementary school (grades preschool through eight) sponsored by the Handmaids of the Sacred Heart of Jesus. It has been recognized by the U.S. Department of Education as an “Exemplary Private School” and as a National Blue Ribbon Award recipient in 1992 and in 2010. In an atmosphere that emphasizes gospel values and is rooted in the values of shared responsibility, human interdependence, dynamic creativity and people empowerment, students learn in theory and experience to appreciate the importance of a global viewpoint and prepare them for the challenges and demands of the future. To meet these challenges, the academy looks toward a constantly evolving curriculum, with a comprehensive and integrated fine arts program and state-of-the-art technology, unveiling a S.T.E.M. laboratory in the 2010-2011 school year.